Provide comfort for the family of Mary Ann Nice with a meaningful gesture of sympathy. 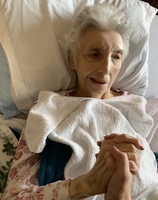 Mary Ann, 82, of Washington, died Saturday, April 13, 2019, in the Washington County Health Center. She was born August 15, 1936, in Cecil Twp. a daughter of the late Fred and Anna Balt Benish. She enjoyed gardening, crocheting, doing crossword puzzles and taking care of her grandchildren. 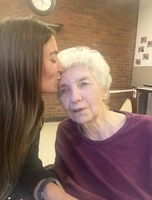 Surviving are her daughter, Cheryl Ann Nice of Langeloth; grandchildren, Tommy, Josh, Tiffany, and Jessica Huxley, Daryl and Mike Tustin, Raelynn and Jan Nice; great grandchildren, Madalynn, Makayla, Serenity and Thea. She was preceded in death by her husband, Raymer L. Nice (1985), son, Raymer Nice and daughter, Roberta Nice. Friends will be received 11 a.m. – 12 noon, Wednesday the time of service, in the Thomas-Little Funeral Service, Inc., 106 St. John Street, Midway (724-796-3301) Interment will follow in Center Cemetery. To send flowers in memory of Mary Ann Nice (Benish), please visit our Heartfelt Sympathies Store. Provide comfort for the family of Mary Ann Nice (Benish) by sending flowers. May the family of Mary Ann Nice please accept my sincere condolences hoping you find comfort in God's words at Acts 24:15 and Psalm 37:29.